Access to Treatment --Should We Wait for Barcelona? Durban, South Africa, 12 July 2000 — Today at the XIII International AIDS Conference in Durban, Médecins Sans Frontières (MSF) called for rapid introduction of national programs to reduce mother-to-child transmission (MTCT) of HIV, and staged introduction of antiretroviral projects where possible. Presentation after presentation at the conference has stressed the growing consensus that treatment interventions can be effective in resource-poor countries in Africa, Asia, and Latin America. Access issues have dominated this conference, but the political will on the national level and funding on the international level have not been forthcoming. Several courageous African governments, such as Côte d’Ivoire, Botswana and Uganda, have shown their determination to implement MTCT programs and begin expanding antiretroviral pilot projects. Others have so far remained silent. In addition, announcements of international initiatives from the US and the EU have been weak on treatment components relative to the enormity of the need. There is also an urgent need for affordable antiretroviral drugs in order to begin implementation of new treatment strategies. Over the past four days, announcements of new initiatives on the part of drug companies and international agencies have been greeted with fanfare. Although MSF is encouraged that drug companies are attempting to address the access crisis, these initiatives need to be put into perspective. Our experience with the proposed Pfizer fluconazole donation shows that these programs are likely to come with unacceptable conditions for national health ministries and will not be sustainable over the long-term. The MSF report states that through dramatically expanded generic production and bulk purchasing, the price of antiretroviral treatment could be reduced to as little as US$200 a year. MSF also called for increased funding to procure these treatments as well as strengthen national AIDS programs in poor countries. At today’s briefing, MSF stated the situation will not improve until funding is allocated to begin programs. Wealthy nations need to make firm commitments to support national programs that UNAIDS estimates need an additional US$3 billion annually. 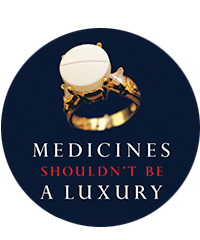 One third of the world’s population lacks access to essential medicines. In the most impoverished parts of Africa and Asia that number is more than 50%. The spread of the AIDS epidemic has been exacerbated by the lack of access to medicines. Ninety-five percent of the 34 million people with HIV/AIDS remain without access to treatment. Many factors contribute to the problem of limited access to essential medicines: the emerging global trade system, which sets the rules for how products are sold within and between countries, is one. This system treats medicines like other non-essential products, and, as a medical humanitarian organization, Médecins Sans Frontières (MSF) believes this is unacceptable.